In the past three days I have had the most spectacular experience. The reason why I have had the most spectacular experience was because we I had Triathlon. Triathlon is involving three different kind of sports like Swimming, Biking and Running. Triathlon is our Kiwi sport for the week. The Triathlon was held at the field. The instructors are Brett, Lance, Blair and Adrian. First everybody had 4 turns on the water slide then after there four turns they made sure there helmets were on properly then we rode around the field 4 times. After the biking we had to run around the whole field once then run to the finish line. 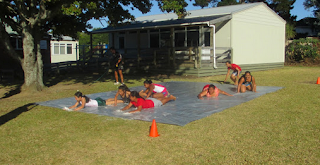 When we all finished we came back to class with sweat rolling down the side of our faces. Everybody was very exhausted. But it is a big change to do Triathlon and we are very lucky to get the chance to try Triathlon out.